The objective of Archival Garment Storage is to protect textiles from their two main enemies: the ultraviolet rays found in sunlight and acid from sources such as skin, wood and wood-based products (paper). Here are some tips for protecting your most cherished textiles. 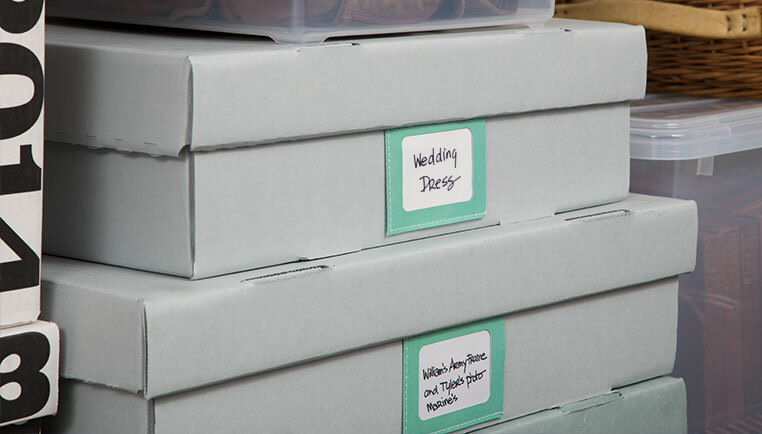 To protect wedding or christening gowns or heirloom textiles, use Garment Archival Storage boxes. They're constructed from acid-free materials and crafted into solid, secure boxes that resist dust, dirt and light infiltration. Our Garment Archival Boxes also include Acid-Free Tissue. Before storing the item, have it professionally dry cleaned or laundered, paying special attention to stains that, if left untreated, will speed deterioration of the fibers containing the stain. Next, stuff garments with Acid-Free Tissue to help retain the shape and prevent fiber breakage — be certain to stuff tissue in the arms of the garment as well. Completely wrap the entire surface area of the garment in Acid-Free Tissue so that no part is exposed. Remove cardboard inserts, bodices, and supports that can create strain on the fabric (and which contain acid that can yellow the fabric.) Be certain to get rid of any non-archival tissue paper. Fold textiles such as tablecloths, napkins or quilts with Acid-Free Tissue between each layer, completely covering the exterior surface.